Bonus Passover Recipe from our Newest Cookbook Author! You might not know the name Daniella Silver yet, but you’re about to! Daniella’s upcoming cookbook is scheduled for release on May 6th. Daniella Silver, a fresh face in the world of Kosher Cookbooks, has teamed up with famed Kosher cookbook author Norene Gilletz to create this phenomenal new cookbook that delivers over 160 wholesome, family-friendly recipes that you’ll make again and again. The Silver Platter is scheduled for release on May 6th, but we’re giving our blog readers a bonus Pesach recipe from Daniella Silver, to give you a taste of her recipes. Daniella’s cooking style is all about taking simple ingredients and turning them into spectacular and wholesome meals.Here’s a bonus recipe from Daniella Silver, author of the forthcoming cookbook, The Silver Platter. This phenomenal yet easy side dish recipe is great for Passover – and year round! With their crispy golden crust and a creamy whipped center flecked with fresh scallions, these Garlicky Potato Mounds are an elevated take on classic comfort food. Serve two mounds per plate for an elegant presentation. 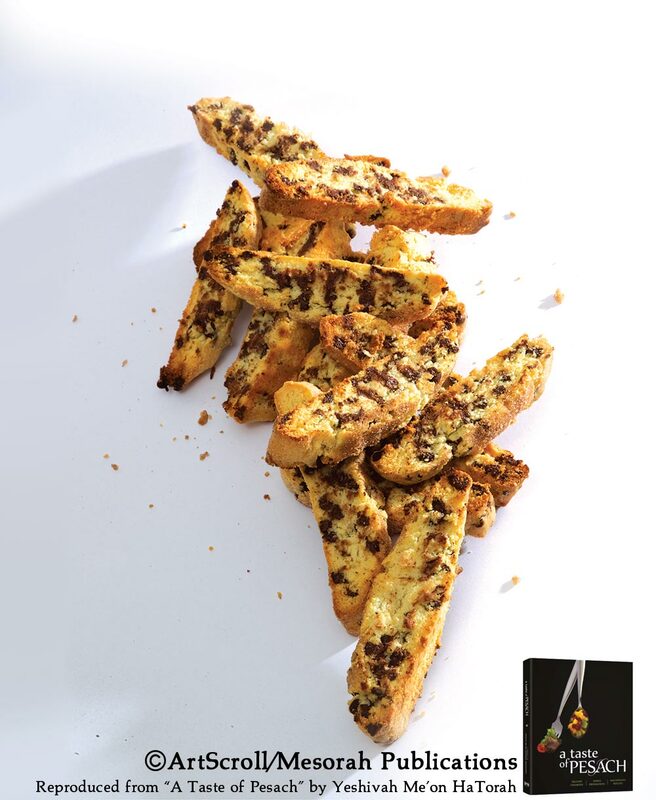 Click here to download or print the recipe for Garlicky Potato Mounds. Click here to pre-order your copy of The Silver Platter. In a large saucepan, combine potatoes and garlic. Add enough lightly salted water to cover by 1 inch. Bring to a boil. Reduce heat; simmer, covered, for 20 minutes, or until potatoes are tender. Remove from heat; drain well. Return potatoes and garlic to saucepan and place back on the heat for 1-2 minutes to evaporate any excess moisture. Remove from heat. Mash potatoes and garlic until smooth. Gradually blend in broth, oil, salt, and pepper. Whip until light and creamy. Stir in scallions. Line a rimmed baking with parchment paper. Bake, uncovered, for 25-30 minutes, until crusty. Dry, mealy potatoes have high starch content and are perfect for baked or mashed potatoes. Waxy potatoes have lower starch content and are best for boiling, scalloped potatoes, or potato salad. If you don’t know which type of potato you have, put it in a brine of 2 Tbsp salt dissolved in 1½ cups cold water. Mealy potatoes will sink; waxy ones will float. If your potatoes are tinged with green, cut off and discard any green parts. The green layer under the skin is called solanin and is poisonous. Stay tuned for more information on the book, an interview with Daniella, and giveaways! If you liked this post, your friends will too! Please share it using any of the social sharing options below. With Pesach just a week away, there’s a ton of preparation to be done. There’s a kitchen to kasher, food to cook, and of course, a Seder to prepare for. 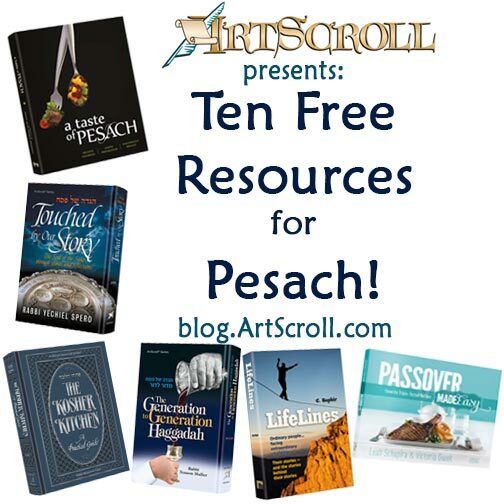 Here are the Official ArtScroll Blog, we’ve been helping you along with free dowloads and guides to assist in your Pesach preparation. 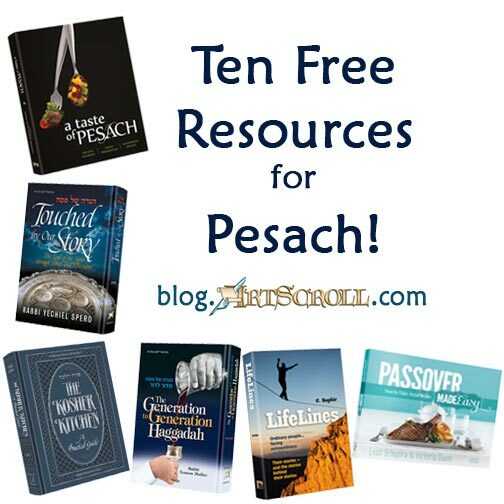 To make sure you haven’t missed any, here’s a roundup of all of the Pesach resources we’ve shared. It’s not too late to get your Passover order delivered in time! 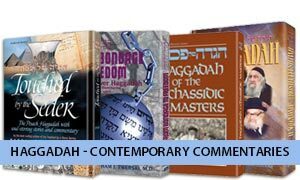 Click here to shop all Pesach titles on ArtScroll.com. If you found this post useful, your friends will too! Spread the word by sending this to a friend or using any of the social sharing options below. Pesach is just a week away, which means that kosher kitchens around the world will be “turned-over” – cleaned, covered and prepared for Passover cooking. To help with this sometimes complicated process, we’ve prepared a free download with a practical halachic guide to Kashering your kitchen, excerpted from The Kosher Kitchen. Click here to view, download or print KASHERING FOR PESACH excerpted from The Kosher Kitchen. Click here to purchase The Kosher Kitchen. Click here to shop all Passover titles from ArtScroll. For Jewish cooks all over the world, the search for Passover recipes usually means shelving your favorite cookbooks for a week or two. But we have good news for all of you fans of our latest hit cookbook, Secret Restaurant Recipes. 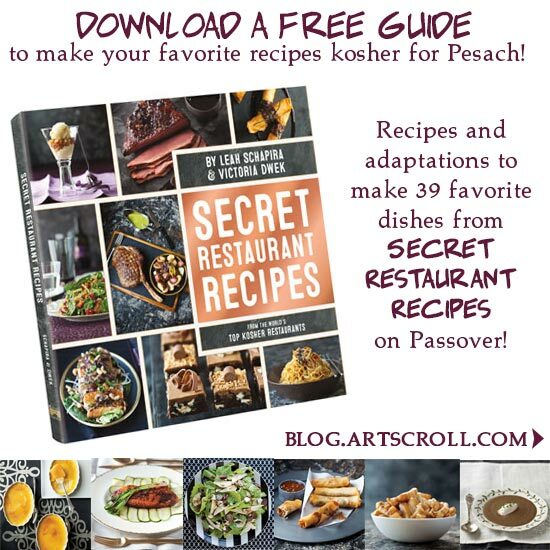 Authors Leah Schapira and Victoria Dwek have compiled a handy list of 39 favorite recipes from this fantastic book – so you can keep cooking those favorites all through Pesach! Also available: list of Kosher for Passover recipes from Fresh and Easy Kosher Cooking. 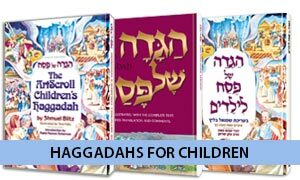 ArtScroll’s two new Haggadahs, Haggadah Touched by Our Story (by Rabbi Yechiel Spero) and The Generation to Generation Haggadah (by Rabbi Nosson Muller), are already getting rave reviews. Last week, we offered you a chance to win a copy of each new Haggadah in our pre-pesach giveaway. 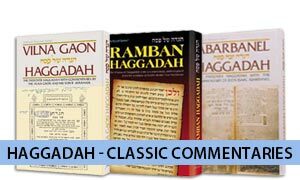 Now, we’re giving all of our readers a chance to try the Haggadahs free! 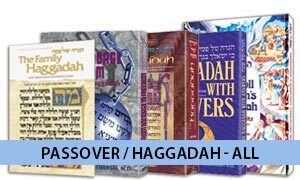 Scroll down to download a free sampler of each Haggadah! Didn’t enter the giveaway yet? It’s not too late! 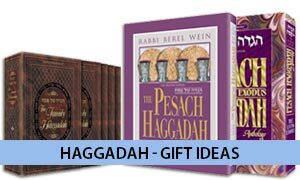 Giveaway ends at midnight on Wednesday – click here to enter for your free chance to win one of each new Haggadah! The Haggadah. It’s our story. Let’s make sure we tell it well. “No Child Left Behind” — especially on Seder night. 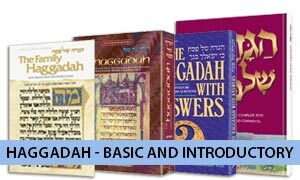 Dont’ forget to prepare for the seder with the Haggadah that’s the best fit for every person at your table. 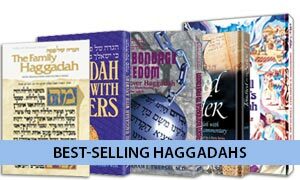 You’ll definitely going to find the one you’re looking for with ArtScroll’s selection of over 60 Haggadahs! 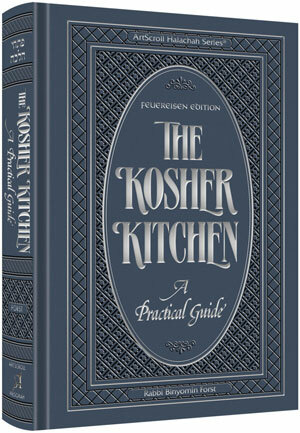 With Pesach around the corner, ArtScroll is here to help with your menu planning! ArtScroll’s selection of Passover cookbooks have sold nearly 100,000 copies, so you know they’re great, that their recipes work, and people turn to them again and again. Here are five great sample recipes to enjoy over the holiday. Even though these recipes are Kosher for Pesach, you’ll probably turn to them all-year-round! 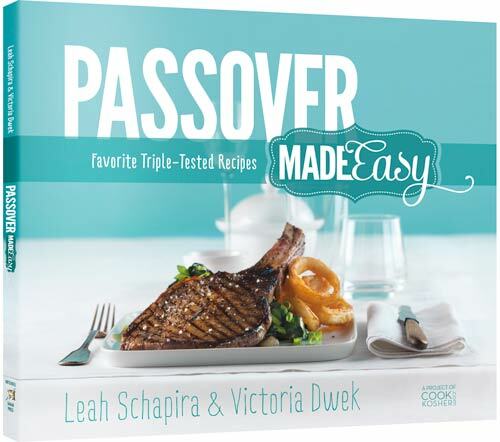 Make sure to pick up a copy of Passover by Design, Passover Made Easy and A Taste of Pesach for hundreds more delicious menu options. Looking for even more Passover recipes? Click here for last year’s free recipe downloads. Did you enter our giveaway yet? There’s a double haggadah giveaway happening right now. Click here to enter.